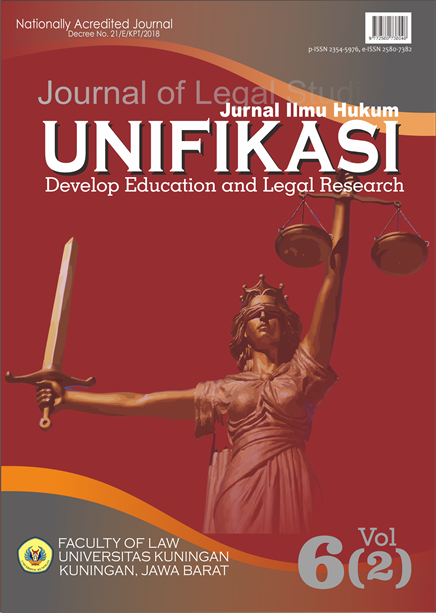 UNIFIKASI��is a peer-reviewed journal published 2 (two) times a year in�January-June, deadline submitted 31 January��and�July-December, deadline submitted 31 July. All papers submitted to this journal can be written in Bahasa and English language. The editors, hence, is pleased to announce a�Call for Papers�for the next issue to be published in��Volume 05 (on June, and December 2018) edition. Organized by�Faculty of Law, Universitas Kuningan, Indonesia.